This hand-painted advertising sign was created for Londontown Department Store in Whanganui, located on Victoria Avenue. The sign was painted by Cecil Cornish while he was working for Seivewright Advertising. Cornish was a sign writer for many businesses in Whanganui. 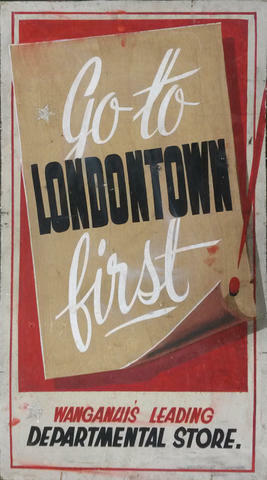 Painted on very thick cardboard, the sign has the words "Go to Londontown first" in white and black against a scroll image on a red background on one side. The other side has the same slogan against a black background surrounded with a red ribbon. Londontown was founded in May 1928, a venture started by W J Robinson. His original business was a small retail shop in Victoria Avenue, only a small distance from where the much larger business of later years was located. Over the years the business grew and expanded, on numerous occasions, taking in other premises. By 1970 Londontown had a staff of 70 and had developed a modern frontage to St Hill Street. Following Mr Robinson's retirement the business was run by his daughter Eleanor Burgess who was managing director from 1947 to 1976 and chairman of directors from 1947 to 1965. Londontown closed in February 1989 when it was known as PDC Holdings Ltd (Watchman Holdings Ltd, Palmerston North) and went suddenly into receivership. Cecil Cornish was a signwriter for many Whanganui businesses. Go to / LONDONTOWN / first! / WANGANUI'S LEADING / DEPARTMENTAL STORE.